Experts recommend that children have their first dental visit by age one, or when their first tooth is visible. From there, children may need as many as 10 dental visits before kindergarten! Since February is National Children’s Dental Health Month, we’re focusing on how a positive, early introduction to the dentist will set your child up for a lifetime of good oral health. Luckily, there are many ways you can help prepare your child and foster good feelings toward the dentist. Read on to learn how our four tips can help your little one LOVE the dentist! To put it simply, the earlier you help prepare your child, the better. When your child is introduced to dental care at an early age, he or she will be more open to new things, and you can find ways to help him or her feel comfortable from the very start. At around age one, your child’s first dental visit should be quick, and it’s a great opportunity for your child to get to know the dentist and become familiar with the office. As a bonus, you can also ask about preventative care, like helpful tips for avoiding cavities and how you can instill good brushing habits. You can make it easier for your child by preparing in enjoyable, kid-friendly ways! We suggest reading books and playing games with simple role-playing. 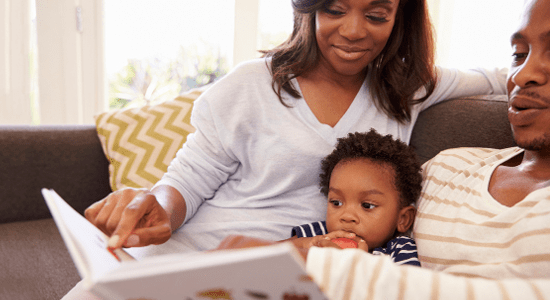 By reading books about dental visits, it will help your child become familiar with the dentist, and also will give you a chance to talk about what will happen and why oral care is important. There are a surprising number of dental books available, and many even feature your child’s favorite characters! Reading is a great way to introduce your child to dentistry while making it fun! Another great tool is to role-play with your child. You can initially play the dentist, and then take turns having him or her play the dentist while you play the patient. It’s a good idea to avoid any “scary” noises and tools. Instead, have your little one open his or her mouth and simply count teeth. When it’s your child’s turn, you can play the patient, and let him or her see your teeth. You can also encourage playing dentist with stuffed animals, or even get a dentist “dress up” play set. If you’re apprehensive about dentistry yourself, your child will likely pick up on your own fear and anxiety. Therefore, it’s imperative to watch your words and maintain a positive attitude! Don’t talk about bad experiences, and keep your negative feelings to yourself. Instead, use positive words and reinforce ideas about cleanliness and good oral health. After the visit, be sure to praise your child for good behavior and bravery. 4. Choose a kid-friendly atmosphere. While most dentists will see patients of all ages, it’s important to choose a dentist that’s happy to treat little patients as well. 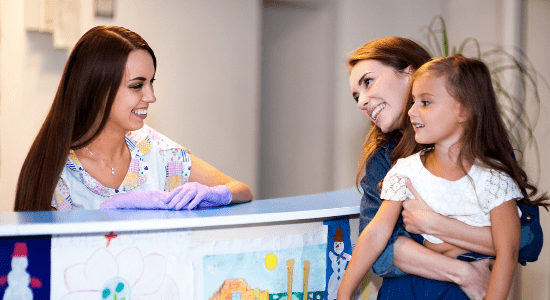 You can ask when you make your child’s appointment, or just notice the general office vibe at your next visit. Be sure to choose a dental office that loves to see kids! Some good indicators include fun toys and games in the waiting room and a friendly, approachable team that is trained to help children feel at ease. Remember that finding a great office can make all the difference, so be sure to choose a team that will prepare your child for a lifetime of dental successes! 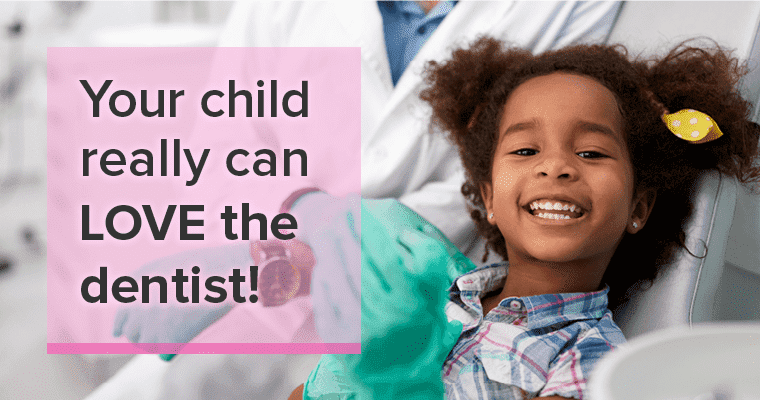 Help your child LOVE the dentist! When it comes to oral care, setting up a solid foundation in childhood is important. So even though February is National Children’s Dental Health Month, it’s a good idea to practice every month! The long-term goal is to support good health habits so your little one continues with regular visits into adulthood. To help your child LOVE the dentist, you can begin early and make it fun! Also, be sure to set a good example, and choose a kid-friendly office where your child will feel comfortable. Have you had success with LOVING your dentist? Can you offer any other tips?